I just have to share this snippet of play from the other day. I'd left some play dough, & a basket of shells & glass stones/beads set out on an outdoor table for Minnie to explore if she wished. 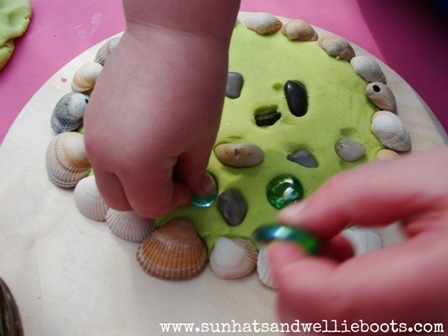 When she discovered them she started by decorating a small section of play dough with a few shells & a couple of beads. 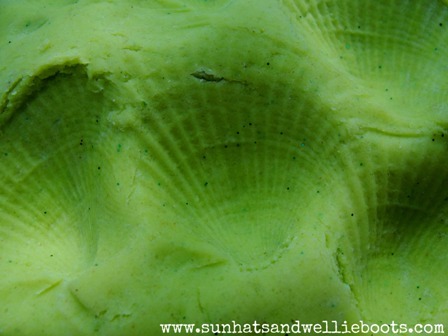 She then pressed several shells into the larger section of play dough & was fascinated by the patterns they left. 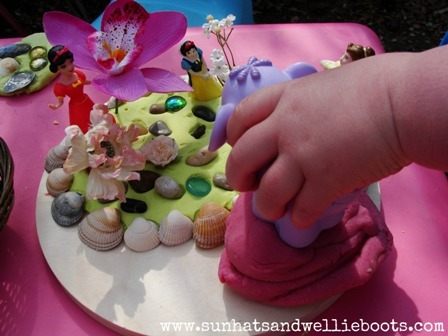 Next she asked if I would flatten the play dough & "make it round!" 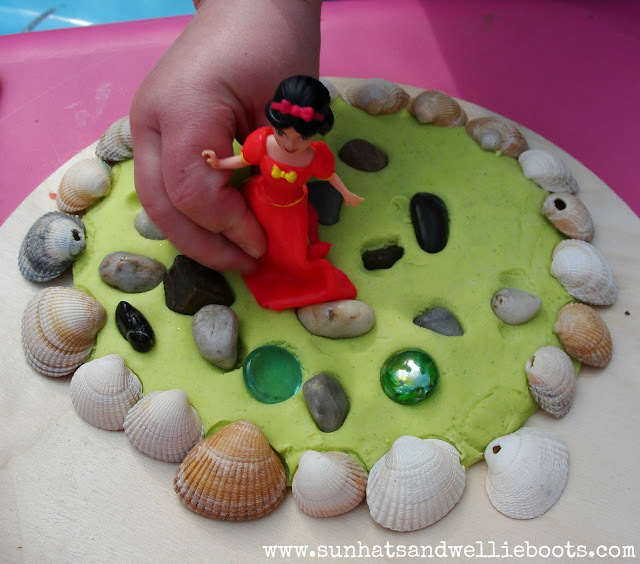 She started to add shells around the edge of the play dough asking me to help her. 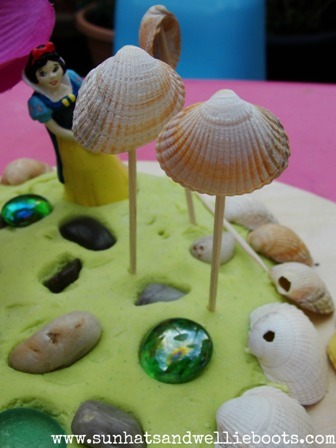 Once the edging was complete she added shells & pebbles to the centre of the dough. 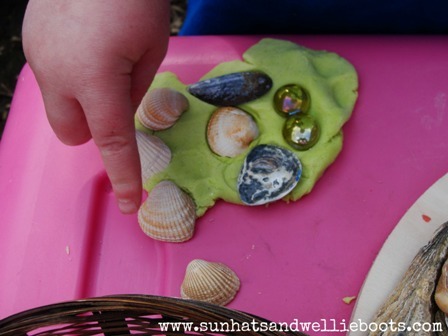 "I'm making a fairy garden" she told me proudly. She collected some play figures & moved them along the 'stepping stones' to prevent the dolls feet getting wet!! 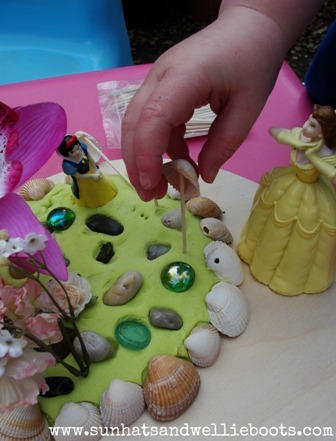 A few silk flowers were collected from our Fairy Land Egg Carton & more play figures came to visit the 'beautiful' garden. I was sorting out a craft box beside her where she found a packet of cocktail sticks & added these to her play. I was amazed to watch her balancing the shells on the sticks to make trees, & the care & concentration she displayed as she gently hung each shell! I love play when it just evolves like this! When it turns into something completely different from what you initially anticipated. Just wonderful! 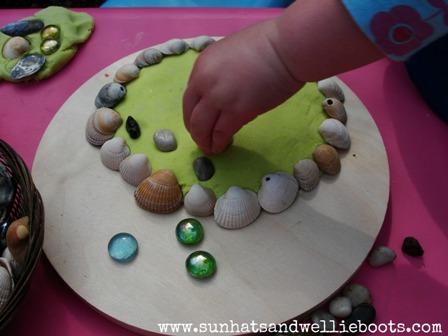 This play set up was so simple & inexpensive to put together. 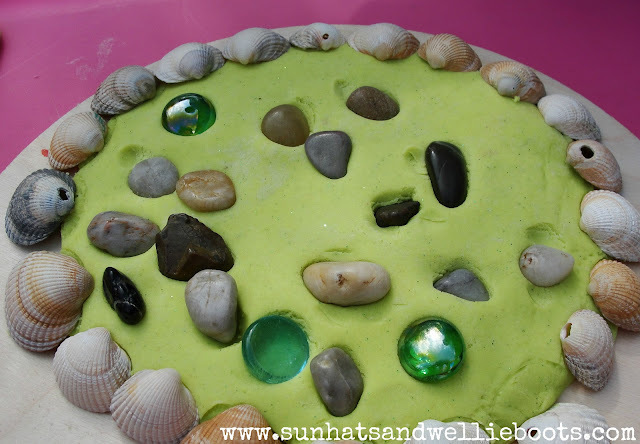 We used homemade play dough, shells collected from numerous beach walks, play figures which came from a selection that we bought from a jumble sale, & glass beads which came from a charity shop for 50p! 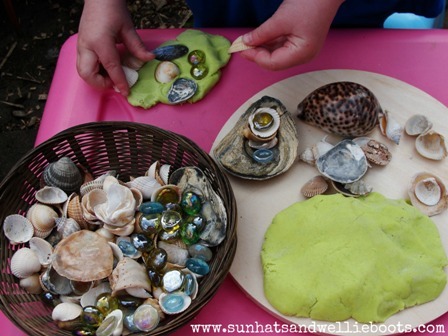 So many opportunities for discovery & play from a few simple objects.